NOVA's precision glass manufacturers' capabilities allow us to accommodate nearly any custom glass product design and application. To discuss how NOVA can help with the engineering, design, and production of highly custom precision glass manufacturing needs, please contact us. Typical diameters range from 1" - 16". Please contact NOVA's specialist or complete our Request a Quote form and we will contact you. Pyrex® 7740 is Corning's trade name borosilicate glass. It has a low coefficient of thermal expansion and good heat shock resistance. Pyrex® can be used as a substitute for Schott Borofloat® in most cases. NOVA offers CNC mill, drill, cut, lapped or polished Pyrex® to any dimension, shape or surface finish. BOROFLOAT® 33 is a clear and transparent colorless glass. The excellent transparency of BOROFLOAT® 33 in both the ultraviolet and in the visible and near infrared range of light makes it ideal as a cover panel for many types of floodlights, high-power spotlights and sunbeds (up to operating temperatures of 450°C). Its extra low inherent fluorescence (light emission), combined with very good surface quality, flatness and homogeneity, opens up a wide-range of possible applications for BOROFLOAT® 33 in optics, opto-electronics, photonics and analytical equipment. Soda lime, also known as AR / Flint or Float glass, contains both sodium and calcium and is formed by drawing the glass over molten tin baths or redrawing into rod or tubing. Because of its chemical properties, soda lime can also be chemically strengthened to harden the surface and make it more scratch and break resistant. NOVA can supply cut, lapped or polished, wafers and have this material chemically strengthened to many shapes, sizes, and surface finishes. These are amorphous products resulting from high temperature treatment of naturally occurring quartz crystals or sand (SiO2). Fused quartz has a nominal purity of 99.995%, and fused silica 99.90%. Fused quartz and silica are attacked by phosphoric acid at temperatures in the range of 150 °C or higher, and by hydrofluoric acid at all temperatures. Commercial grade ground and polished discs from 1/4" to 22" diameter are available to meet your requirements. 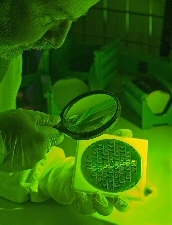 Plate thickness from cover slides a fraction of a millimeter thick to heavier pieces more than 3/4" thick are available. Standard sizes include 3" x 1/16" thick and 4" x 1/16" thick. Optical grade discs must be specified. Rough cut discs must be specified if desired. Vitreous silica is the generic term used to describe all types of silica glass with producers referring to the material as either fused quartz or as fused silica. Originally, these terms were used to distinguish between transparent and opaque grades of the material. Fused quartz products were those produced from quartz crystal to make transparent ware, and fused silica described products manufactured from sand into opaque ware. Today, however, advances in raw material beneficiation permit transparent fusions from sand as well as from crystal. Consequently if naturally occurring crystalline silica (sand or rock) is melted, the material is simply called fused quartz. When silicon dioxide is synthetically derived, however, the material is referred to as synthetic fused silica. Typical diameters for Quartz are 1" to 6". The above items are specialized and are not in our current inventory, but we can obtain the material you need. Please complete our REQUEST A QUOTE form and we will help you meet your requirements. NOVA offers the best competitive pricing without sacrificing quality. No order is too big or too small for us to handle. Contact Us today.